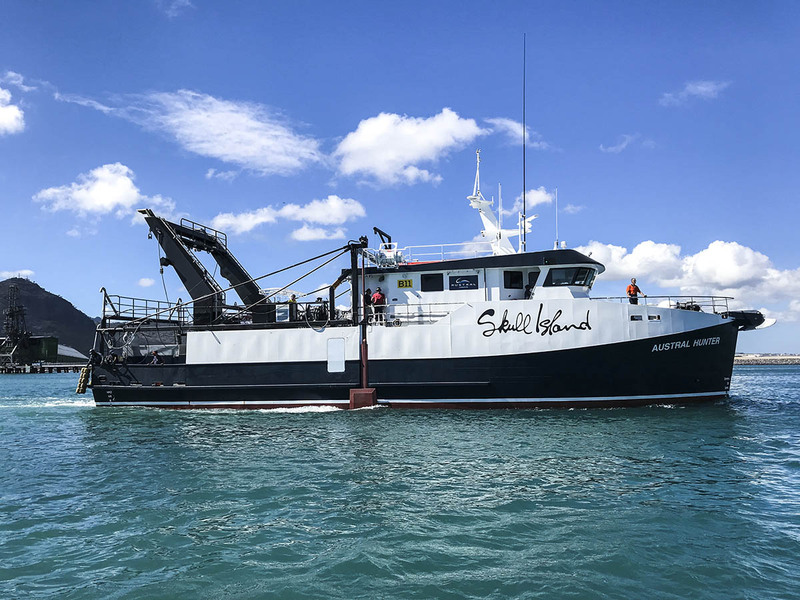 Austral Fisheries operates a fleet of 10 prawn trawlers in the Northern Prawn Fishery (NPF) off the coast of northern Australia catching banana, tiger and endeavour prawns. 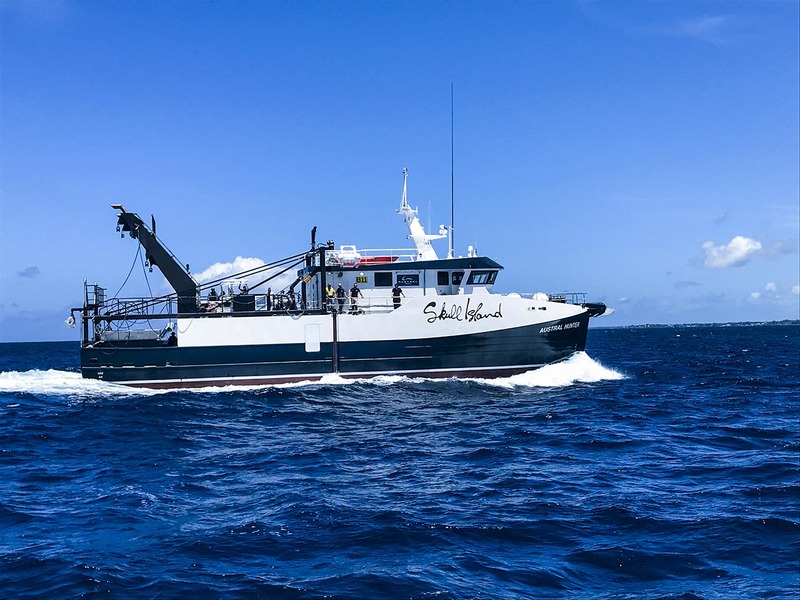 Austral Fisheries contacted Oceantech in April 2014 with an interest in designing a replacement prawn trawler, the first in a series of potentially eight new vessels. The client’s brief was for a larger vessel than those it currently operated – still based on the traditional arrangement, but with significantly larger processing room and accommodation spaces as well as extended range and hold capacity, pushing new levels of autonomy for such a vessel. An overall length range of 27 to 32 metres was nominated by the client with a maximum draught of 3.5 metres for navigating shallower Gulf ports. This is generally a feature of Australian and New Zealand vessels operating in remote regions and why specialised designs exist for these types of vessels that are unique to the region. A final hull length of 30 metres and overall length of 31.50 metres was agreed upon to achieve the objective, however the vessel’s aesthetics confuse the eye as to how large she actually is. Paramount to the client was the safety and wellbeing of the crew and this is evident when moving around the vessel with the absence of vertical ladders, the use of harnesses when navigating rigging and ample space for downtime. While built primarily in steel, aluminium has been used for the wheelhouse and navigation mast structure to reduce both weight and maintenance around these areas. 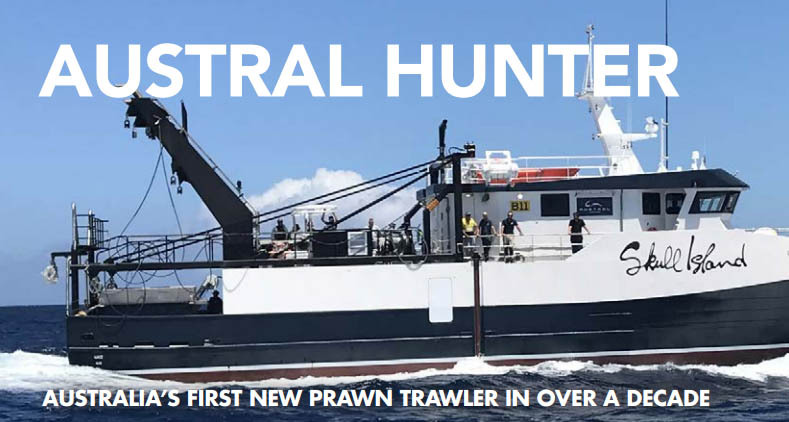 Other than being eight metres larger than most of the prawn trawler designs Oceantech has produced, the Austral Hunter is the first prawn trawler to be built for Australia in the last 12 years, and there has been a lot of new technology developed during that time. It is a totally new design from the keel up and although not easily seen features many advancements in both hull design, engineering and on board equipment. That the vessel can achieve 15+ tonnes of bollard pull using a limited diameter fixed pitch propeller is highly impressive. The vessel fishes in the NPF, which is often referred to as Australia’s last “wild frontier”, across Australia’s top end. The fishery extends from the low water mark to the outer edge of the Australian fishing zone. Its eastern extremity lies at Cape York in Queensland and stretches west to Cape Londonderry in Western Australia. 52 vessels are licensed to operate in the MSC-certified NPF, which covers approximately 880,000 square kilometres. Less than 12 per cent of this area is fished. The fishery was established in the late 1960s and is the most valuable fishery managed by the Australian Government. The vessel’s main function is prawn trawling, requiring all the necessary fitout for catching and processing at sea for extended periods. The most challenging part for the designer was the requirement for an extremely large dual lane catch hopper and refrigerated saltwater (RSW) capacity above the main deck. Traditionally, these vessels have had inbuilt RSW tanks below deck, which leads to issues, prior to processing, with storing the large volumes of product that can come aboard, mainly during the banana prawn season. This requirement had a detrimental impact on stability, so the designer employed various techniques available to minimise this impact. 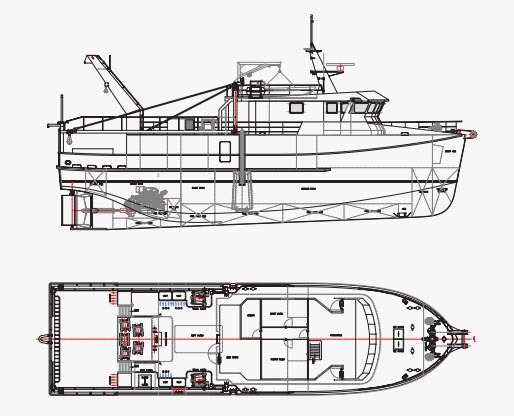 The main and forecastle deck areas are designed to maximise space available to product handling systems and fishing equipment. Even with a 25 per cent larger vessel than most, spare deck room is minimal. The vessel was built at Chantier Naval de l’Océan Indien (CNOI) in Mauritius, which presented the designer and client with the challenge of having to build an Australian domestic commercial vessel (DCV) well and truly offshore with the ability to return home under her own power, fully compliant and ready for fishing operations. The vessel was designed in accordance with the National Standard for Commercial Vessels (NSCV), however Bureau Veritas was selected for scantlings and structural plan approval, which permitted the class society to conduct structural survey on behalf of AMSA. The accommodation was done by CNOI and is a standard of finish generally found on larger commercial vessels with vinyl covered pressed metal linings and internal doors. It is evident moving through the vessel the designer had to fit a very large amount of equipment and features in a small space even though the vessel is 25 per cent larger than most of existing vessel in the fleet. Everything on the vessel has been optimised to receive and process bulk product whilst maintaining the highest levels of quality. Everything is oversized and built for the extreme from the dual-lane insulated catch hopper to the four individual snap freezers, from the huge Northstar ice slurry plant to the 100-tonne freezer hold, and the massive refrigeration plant in its own subdivided compartment with full redundancy. 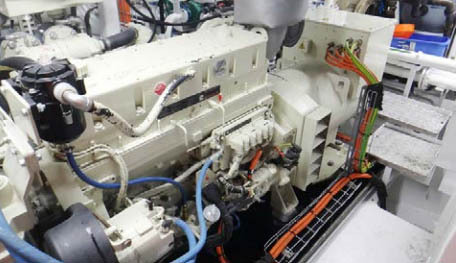 Its fuel and catch hold capacity allows the vessel to stay at sea without refuelling or unloading for extended periods and this is a huge benefit in such a remote region with limited facilities. The main refrigerated hold has a capacity of 100 tonnes. All product is graded, packed and frozen at sea in three-, five- and 10kg boxes. There are two 150 carton snap freezers on the main deck and one 300 carton snap freezers in the freezer hold. Once product is frozen it is then transferred to the main freezer hold for storage. All main refrigeration equipment is located in the separate plant room forward of the engine room. It is comprised of two identical but separate systems. The snap and hold compressors are twostage reciprocating compressors chosen for low power consumption, and continued efficiency at low saturated suction temperatures (SST), and are therefore superior low temperature applications. This allows all product to be snap frozen in eight to 10 hours to -18°C. VSD drives are used throughout. Propulsion and power generation machinery is from Cummins with a Twin Disc Quickshift gearbox providing the ability to slow the prop speed down in port. Coupled with the Twin Disc electronic controls and fly-by-wire steering, this makes for effortless control. The hydraulic systems design and supply was by Fremantle Hydraulics and features Neumann trawl and line winches and a horizontal anchor windlass. All processing equipment was supplied by KM Fish Machinery of Denmark with custom hopper and RSW tank liners supplied by Calibre Marine in South Australia. Furuno electronics feature heavily in the bridge area as well as custom digital switching and monitoring systems by M2i Electrical from Queensland. The vessel’s prominent wing stabilisers as seen on the majority of the Oceantech trawlers provide unparalleled comfort for the master and crew, reducing fatigue and improving vessel performance. With a high level of accommodation fitout, this class of vessel is very attractive for attracting and employing the best crews. Austral Hunter is currently fishing with lead skipper Dwayne Klinkhamer at the helm and being closely evaluated by Austral management. Upon completion of the first season, the brief for the remaining vessels, potentially up to seven more, will be finalised, along with a decision on where to build them.